Do PAB Accounts, margin requirements and FOCUS reports give you a headache? Do you need to take the FINRA Series 28 exam? If you can answer yes to both questions, then let Solomon Exam Prep help relieve your anxiety. 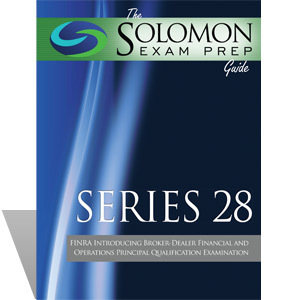 The Solomon Exam Prep Guide to the Series 28 FINRA Introducing Broker-Dealer Financial and Operations Principal Qualification Examination offers an efficient and comprehensive overview of what you need to know to pass the Series 28 exam. By focusing on the most important aspects of the exam, and including lots of exercises and practice questions, as well as a glossary, the Solomon Exam Prep Guide will get you on track to passing the Series 28 in no time. Solomon Exam Prep has helped thousands pass their FINRA, MSRB, and NASAA licensing exams. Let our expertise help guide you through the Series 28 maze so you can enter the exam room with confidence. The Series 28 Exam Study Guide is available as an online digital study manual via your online student dashboard (requires Internet connection/not downloadable) or as a hard copy textbook (shipping & handling will apply). How do I register to take the Series 28? To take the Series 28, a FINRA member firm must file a Form U4 application on your behalf through FINRA’s Central Registration Depository (CRD). There are no prerequisites to take the Series 28; however, you will have to get fingerprinted and answer a lengthy set of questions about your background. What does a Series 28 license allow me to do? The Series 28 qualifies you to become an Introducing Broker/Dealer Financial and Operations Principal. This is an individual who is responsible for correctly preparing and maintaining the books and records for specific member firms. Passing the Series 28 exam demonstrates that you adequately understand how to prepare and maintain the books and records of your firm in compliance with securities laws and regulations. Once you have passed your Series 28, you will be eligible to register as an Operations Professional, without having to pass your Series 99. Note that the Series 28 does not qualify you to be a Financial and Operations Principal for member firms that have a net capital requirement of at least $250,000 or municipal dealers who have a net capital requirement of $150,000. The books and records for these kinds of firms must be prepared by someone who holds a Series 27. Note: Your score will be rounded down to the next lowest whole number (e.g. 68.9% would be a final score of 68%--not a passing score for the Series 28 Exam). There are 95 multiple-choice questions. What subjects does the Series 28 exam test? 2 hours. You are allowed to take restroom breaks during the exam; however, the clock will continue counting down. Please contact your preferred testing center for additional information. Are there other FINRA exams I need to complete as a prerequisite to attempting the Series 28? If I stop working for my firm, how long will my Series 28 license remain active? When you cease working for a firm, your employer will file a Form U5 to terminate your registration. Your next employer will file a Form U4, which will re-register you. As long as you do not exceed two years between employers, your Series 28 license will remain active. You guys were instrumental to my passing the Series 79. The study materials were incredibly helpful and the quizzes and tests gave me great "live" practice. The staff reached out to me a few times to see how I was doing, answer questions and offer helpful tips. I was pleasantly surprised and greatly aided by their personal approach to ensuring my success. Passed Series 62 on the first try. Much better program than other companies I used for 6, 63, and 65. Excellent test questions.